Last year in the second quarter, the homeownership rate hit 62.9 percent, the lowest recorded since 1965 in a pattern of decline that began in 2005. As shown in the graph below, the homeownership rate has been creeping up since that historic low, though it remains an arms-length from the height of the boom when the rate topped 69 percent. Census data released today shows that the homeownership rate inched forward ever so slightly in the third quarter of 2017 to 63.9 percent, a change not considered “statistically different” from the the second quarter rate (63.7 percent) or the third quarter 2016 rate (63.5 percent), but still another marker on the modest upward path. Though demand for housing is high thanks to low interest rates, a number of current market factors are suppressing bigger gains, namely the inventory shortage and booming home prices. In Q3, the homeownership rate was highest in the Midwest (69.1 percent), followed by the South (65.5 percent), the Northeast (60.4) percent and the West (58.9 percent). When it comes to demographics, the homeownership rate was highest for those 65 years and over (78.9 percent) and the lowest for millennials (35.6 percent). Seventy-two percent of non-Hispanic White Alone households were homeowners — the highest homeownership rate for any single race. The rate for Asian, Native Hawaiian and Pacific Islander Alone households was at 57.1 percent, and Black Alone Households shored up the end of the pack with a 42.0 percent homeownership rate. The homeownership for Hispanic households, which can be any race, was at 46.1 percent. Lastly, the homeownership rate for households making more than the median family income was at 78.4 percent in Q3, while the rate for households making less than the median family income was at 49.5. Both rates were essentially unchanged from Q2 2017 and Q3 2016. The median asking sales price for for-sale units was $187,300 — $12,700 away from the 2007 pre-recession peak of $200,000. Rental vacancy rates were highest in the South (9.4 percent) and Midwest (8.1 percent). 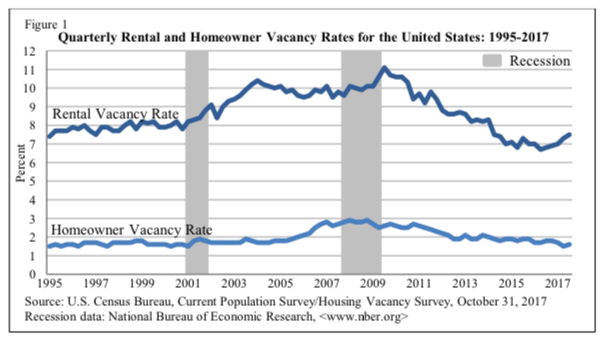 Meanwhile, homeowner vacancy rates were highest in the Northeast (1.9 percent) and South (1.8 percent).